Today we adventure into a triple western packed showdown of perfection old school style. The reason why I'm doing a triple feature review instead of the single reviews, is because I first saw my first Western Film as a triple feature back in 1986 as a three feature Gunslinger Marathon. There was an all-night Drive-In movie marathon at the local Drive-In once a month, and there was always a subject whether it be horror, sci-fi or Western, the B-grade films always had something in common. So, I thought it would be fitting to display them together. Twilight Time Blu-ray has released all three on a special edition Blu-ray of 3000 units produced. All three films have never looked any better. Never sounded any better. All three are crisp in imagery, clear in sound, vibrant in color. All three are truly classic western films in a sense of the Drive-In adventure. These are films that should be seen, and respected for giving fun, older style entertainment. So many western films are classified in the B-grade scale like Horror or Sci-fi. Western never gets the special treatment that so many deserve. Thankfully there is a growing film lover population for these films. Twilight Time did a lovely job in mastering new outlets for all three of these films. I thankfully grew up during a time of the 80’s, and even the early 90’s consisted of late night movie marathons at local theaters, or remaining Drive-In’s. Now I never saw these three at any of these places but I did see many triple feature westerns on these events. So, I thought it would be great watching these three as triple features in honor of those late-night marathons from my childhood. Twilight Time always does an amazing wonderful job in capturing great films on lovely 3,000 Unit Blu-rays. 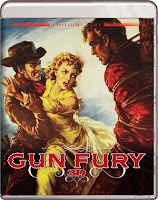 First up is Gun Fury 3D and 2D Special Edition. I remember seeing this as a kid with my Uncle Earl. He was a huge Lee Marvin fan, and so I became one also. Marvin was a true manly man actor. He was a gifted soul of pure acting genius that gave everything to his characters in his vast film career. From action, to drama, to everything in-between. He had away with capturing a brutally honest, and emotional charged reality. Gun Fury is one of those films that his talent shines. Twilight Time did another fantastic job on an important product. Another top-notch Blu-ray by an amazing company. Also starring the amazing one of a kind Rock Hudson who needs no introduction. A master at film and is a true icon of cinema. Gun Fury is about a stagecoach that is held up by a ruthless gang ran by bad guy Frank Slayton played with perfection by Philip Carey. Robbing this stagecoach, this gang and its brutal mentality leaves Ben Warren (Rock Hudson) for dead, kidnapping his woman and riding off with her. Soon Warren must pull together, seek out and follow this ruthless gang. Sadly, Ben finds that the locals and the townspeople want nothing to do with the gang. They won’t help him find his woman, or make the wrong right. Everyone is scared. Thankfully he can find two that are willing to seek revenge toward the gang. Next Up is 1967’s Hour of the Gun. Growing up I was either in school, or at my Uncle Earl’s. My Uncle Earl bleed manly western cowboy. If he didn’t have a coffee in one hand and a Louis Lamour book in the other, it was a western on TV. I always joked with him that he was a cowboy in the city. Trust me when I say he bleed basic ranch western life, in everything he did. He and I would go to Saturday Matinees of westerns playing on the big screen, and if it was Sunday it was all day westerns on TV. Now days that is rare, but when I was growing up, it was everywhere. 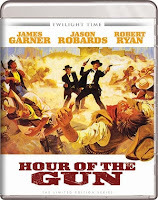 One of those westerns, was Hour of the Gun. I first saw this on an all-day theater marathon, where if you brought in a can food item for the poor, you got in at 50 cents. One step further if you dressed up, you got 25 cent popcorns. Anyways one of those midday flicks on the big screen was Hour of the gun, and that is why I fondly remember it, sitting next to my Uncle Earl, God rest his soul, I miss him greatly, but he gave me lots of amazing memories. Hour of the Gun is about the one and only Western icon and legend Wyatt Earp and his brother Virgil, Morgan and the one and only Doc Holliday. Like in all depictions they confront the famous violent Ike Clanton gang at the one and only shoot out at the O.K. Corral in the tonw of Tombstone. Starring a flawless cast of performers. The whole cast really needs no introduction to any movie lover. The one and only James Garner, the brilliant Fran Converse, the amazing Sam Melville, and the flawless Jason Robards. This also stars the amazing wonderful actor Jon Voight. He is a true acting Pioneer. He has always been a cinema figure to me throughout the movie world. Being in some of the greatest films of all time. He starred in my true personal favorite Midnight Cowboy. He is truly a gifted actor and award worthy performer. Many of his films such as the wonderful amazing awesome disturbing Deliverance (1972), Coming Home (1978) which won him his Academy award for best actor, and his wonderful performance in 1979's The Champ. He is a master talent at acting. He has been honored many times with Twilight Time Blu-ray special editions including one of my personal favorites Conrack. Starring Icon and cinema legend Burt Lancaster. Lancaster is a master at performance. He starred in one of my favorite films Birdman of Alcatraz which might I add Twilight Time has also released on a Special Edition Blu-ray and you can read my review in the Twilight Time section to the left. Before the shooting of the Birdman of Alcatraz film, he sat down and talked with the true-life Birdman, Stroud, to me that shows you the mastery this actor had for creating memorable characters throughout his long career. Lancaster does a fantastic job in anything he does, but I felt the Stroud character was his defining role. He is a legend and a true one of a kind acting master that never grows old in the viewer’s mind as you experience any of his films. Twilight Time releases two of my favorite films and honored this master, The Train and Birdman of Alcatraz are both defining roles that stand out, and both have always been two of my favorite performances, and most of all two of the great characters in cinema. I just recently watched him in the classic Documentary Series The Unknown War. He hosted this series of World War 2 Russian Front War Footage. He was a dynamic actor that gave so many amazing pieces of cinematic film for all generations. From the amazing 1960’s Elmer Gentry, which won him his Oscar, to as I have mentioned, 1962’s The Birdman of Alcatraz. All one has to do is scan his amazing career, 1946’s The Killers, 1953’s From Here to Eternity, 1957’s Sweet Smell of Success, and one of my personal favorites, Judgement at Nuremberg which has also been a Twilight Time release. Lancaster had an amazing career of films lasting over 45 years of entertainment. Also starring the wonderful Robert Ryan who also starred in another Twilight Time release, House of Bamboo which is a fantastic murder mystery film noir. Robert Ryan was a total guru of B-grade entertainment from countless Film Noirs to murder mysteries, he was a true acting brilliance. Twilight Time Blu-ray. He was an amazing actor that graced the screen both large and TV small screen in well over 90 performances in film and TV. He was truly a one of a kind, and he will always be remembered as the first James Bond movie villain, it was awesome seeing him in this. This is directed by one of my favorite directors. Michael Winner has done some of my favorite guilty pleasure films, starring one of my favorite tough guys, manly man actors, Charles Bronson. Winner was responsible for making the one and only 1974’s Death Wish. Death Wise is a golden ticket of revenge perfection. Winner also did the two sequels, Death Wish 2, and 3. I love this series and Winner is a priceless director in that regard. I loved his no holds bar style of film making with these three films. The Death Wish series is a perfect example of exploitation grindhouse style main stream movies. Solid director behind a series of violent films is always an eye-opening experience. Winner and Bronson worked together many times. Winner always had away with capturing his characters in a brutal fashion. Bronson like Lancaster became somewhat a stable in Winner’s films. Now Winner’s career was a vast array of movie genera’s. From action, to thrillers, to comedy, to drama. He directed one of my favorite, underrated horror films of all time, 1977’s spooky, and disturbing The Sentinel. If you haven’t seen The Sentinel, I highly recommend. As you would guess like most westerns there is a group of bad men. Drunks that go about shooting up towns and being unruly. During one of the groups craziness an old man was killed. A peace officer played by Lancaster, who is named Marshal Jared Maddox. His goal is to bring several men to justice. He has warrants on those involved in the killing. Now to make the reality worse is that all five men work for a rich ranch owner named Vincent Bronson, and so you can guess what happens next. All three of these westerns are classic. Each one has been given a flawless transfer to 1080p High Definition, and all three are perfected, entertainment. Hour of the Gun: Special Features: You get the great Isolated Music Track. The man behind the music for this film needs no introduction to cinema fans. The one and only Jerry Goldsmith. Goldsmith has been a part of some of the greatest film scores both small and large. Just to mention a few, The Omen, Alien, Poltergeist, The Secret of NIMH, Gremlins, Hoosiers, Total Recall, Basic Instinct, Rudy, L.A. Confidential, The Mummy, Von Ryan’s Express, The Blue Max, Planet of the Apes, Patton, Tora! Tora! Tora! Papillion, Chinatown, Logan’s Run, Legend, Alien Nation, The Burbs, many of the Star Trek films. He did so many memorable scores that stand out and are landmarks in film. When Goldsmith died in 2004 the cinema world lost a true master in film making. The music world lost a music genius. Twilight Time honored a passionate master with this special feature and many other of his films. 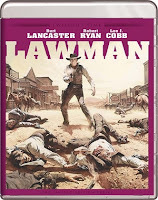 Lawman Special Features: The all-important isolated score track that most all these Twilight Time Blu-ray’s come with. The man behind this music needs no introduction, the one and only Jerry Fielding. He has done countless important pieces of cinema. The Peckinpah masterpiece, The Wild Bunch, and Peckinpah’s great, Straw Dogs. Not only was he a Jazz master, but he was a brilliant, and flawless composer of music. Sadly, he was one of those blacklisted for many years during the crazy witch hunts of Communist red scare. Thankfully after many years of this foolishness, he returned, mastering many great pieces of cinema, both great and small. He was nominated for 3 Academy Awards which he should have won all three. One for The Wild Bunch, which needs no explanation. He should have won for Straw Dogs, and the amazing The Outlaw Josey Wales. He did however receive an Emmy Award in 1980 for Outstanding Achievement. He deserved so many awards for his expertise, and flawless beauty in music. This special feature was a lovely listen to. Twilight Time honored this master with this special feature. Twilight Time did another amazing job at bringing forth three fantastic experiences that they accomplish so greatly. A beautiful transfer to all three, dynamic visual and hearing on all three. All three are priceless examples of how to treat older films. Highly recommend all three films.